Miscellaneous. Watercolour signed W A Richards (lower right). Undated. 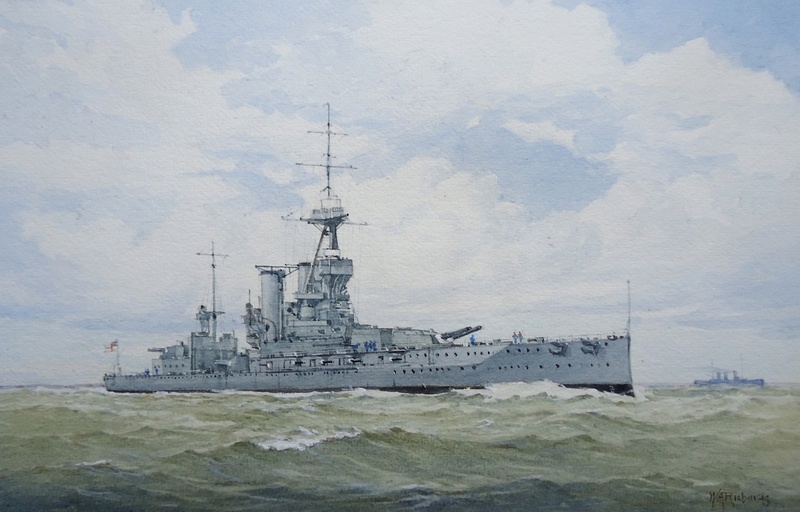 Still unmistakably IRON DUKE of World War 1 and Grand Fleet fame, this watercolour shows her in her post London Naval Treaty state - demilitarised as a gunnery training ship, her armoured belt, and 13.5 inch turrets, B and Y, and several boilers removed so that at full power she was now only capable of around 18 knots. By being converted in this way she was at least spared the fate of her three sisters, MARLBOROUGH, BENBOW and EMPEROR of INDIA who were all paid off and scrapped in the early 1930s and she did invaluable service for thousands of gunnery trainees who learned the ropes of their trade aboard her. IRON DUKE attended the 1935 and 1937 Fleet Reviews at Spithead and come her second world war, that of 1939-1945, IRON DUKE was not found wanting: she was pressed into service in several different guises, harbour defence ship at Scapa Flow, the Home Fleet's main base, and then as an anti-aircraft gun battery at Scapa. Her end finally came in the late 1940s when she was de-commissioned and broken up: it had been some 35 years since she was launched.